Lord Shree Swaminarayan has said, 'My philosophy is the Vishishtadwait philosophy.' Vishishtadvaita philosphy was founded by Shree Ramanujacharya (11th century AD). The ideology is that there are three ultimate realities; The Lord, souls and matter (or maya's creation). Of these only the Lord is the independent reality and the other two are dependent upon Him. The soul and the matter are thus distinct from the Lord but not separate from Him. There are five schools of thought and ideology in Hindu philosophy. They are each elaborate and complex and are concerned with the distinction between the Lord, man and the nature of the cosmos. Advaita, Dvaita-dvaita, Dvaita, Shuddhadvaita and Vishishtadvaita. Vishishtadvaita philosophy was founded by Shree Ramanujacharya (11th century AD). The ideology is that there are three ultimate realities; The Lord, souls and matter (or maya's creation). Of these only the Lord is the independent reality and the other two are dependent upon Him. The soul and the matter are thus distinct from the Lord but not separate from Him. According to Shree Ramanujacharya, the Lord is the creator, preserver and the destroyer of the world. Liberation is not absorption with the Lord, but union with Him. Lord Swaminarayan accepted the basics of this ideology but with distinct differences indicating His own divinity. Lord Swaminarayan revealed there are five, not three, eternal and real entities; Jeeva, Maya, Ishwar, Bhrama and Parabhrama. Parabhrama is the supreme Lord, the other four entities dependent on and are obedient to Him. These four entities remain distinct, but not separate from the Lord. Lord Swaminarayan initially unveiled this ideology during a religious debate in Kashi. Kashi is a eminent gathering place for learned scholars and the most holiest of cities in Hinduism. Accompanying His father, Dharamadev at the age of 10, Lord Ghanshyam eloquently lectured to those gathered in sanskrit. Arguing that the Lord has a definitive form, Lord Ghanshyam, advocated the Vishishtadvaita philosophy and explained it further. He added, there are two real and identical entities; the master and the devotee. When the two merge, they appear as one, the master. Yet in reality they remain distinct in their nature and their attributes, with the Lord remaining the master and the soul forever the mastered. There are many means to please Lord Shree Swaminarayan. Amongst these, to have true loving devotion unto the Lord is the best means of all. One should develop this true loving chaste devotion unto the Lord, together with an understanding of the religious decree, spiritual knowledge and asceticism. By developing such devotion, the devotees should think of their own form to be that of God, and still maintain the sentiments of being the Lord’s humble servant. 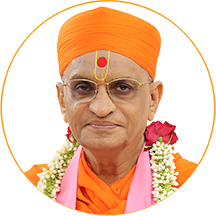 Lord Shree Swaminarayan has said, “My philosophy is the Vishishtadwait philosophy.” He has elucidated its meaning. By His own will, Lord Shree Swaminarayan manifests Himself in different forms. The Sankalp and the Sankalpi, are exactly the same. They grant salvation to numerable souls. At the last moments of the devotees’ life, Lord Shree Swaminarayan gives His divine darshan to their relatives and others. He converts the devotee’s soul to become sakar like Himself and merges the soul into His Murti. In this manner, He enlightens souls to experience the reality of the Vishishtadwait philosophy. The almighty power and supremacy of the name ‘Swaminarayan’ is such that at the time of their death, many witness amazing miracles. Chariots, horsedrawn carriages and aircraft would be seen taking the soul to His abode, and then being merged into His Murti. "If someone has recognised the true essence of the form of God, there remains nothing more for that individual to know. God is extremely competent, extremely lustrous and infinitely great. He conceals His supremacy and lustre within Himself, and assumes the form of a human for the salvation of souls. He assumes a form that can be visualised by humans, in order that they can serve and offer worship etc. to that form. If a tiny thorn pricks the leg of an ant, the thorn cannot be removed using a lance or a knife. A minute needle would be required. Similarly, God conceals His greatness within Himself and assumes an incredibly minute form."